Our unique terrain is ideal for creating the electrical imbalance between cloud and ground that gets equalized by bolts of pure energy hotter than the surface of the sun. About 500,000 lightning flashes strike Colorado each year, with metro Denver and the adjacent Front Range the center of the state’s bullseye. Coloradans’ passion for outdoor recreation expose people to the risk of lightning strikes - from 2008 to 2017, Colorado ranked fourth in the nation for lightning fatalities. Paul Schlatter, the Science and Operations Officer for the National Weather Service’s Boulder Weather Forecast Office, is a Boulder native. He is also currently the President of the National Weather Association (www.nwas.org). During his 16-year career, Paul has served at the highest level of the Weather Service. As NWS's Deputy Chief of Staff in Silver Spring, MD, he supported the NWS director and deputy director and shaped corporate decisions in a wide range of areas, including policy development, strategy and tactics, along with internal and external communications. Paul’s passion is improving operational meteorology. As the Science and Operations Officer SOO, he is responsible for ensuring new science and technology is incorporated into operational products and services. Phil Broscovak, of Boulder, was blown off a rock face by a lightning bolt while climbing Wyoming’s Vedauwoo formation with his family in 2005. A veteran climber on the Colorado climbing scene with numerous first ascents on the Western Slope to his credit, Broscovak has had numerous close calls with lightning and extreme weather, as he recounted in a 2017 first-person essay in Rock and Ice. Science on Tap is a monthly opportunity for science enthusiasts and beer lovers to come together and discover the latest and greatest research in science and technology that is happening right here on the Front Range. 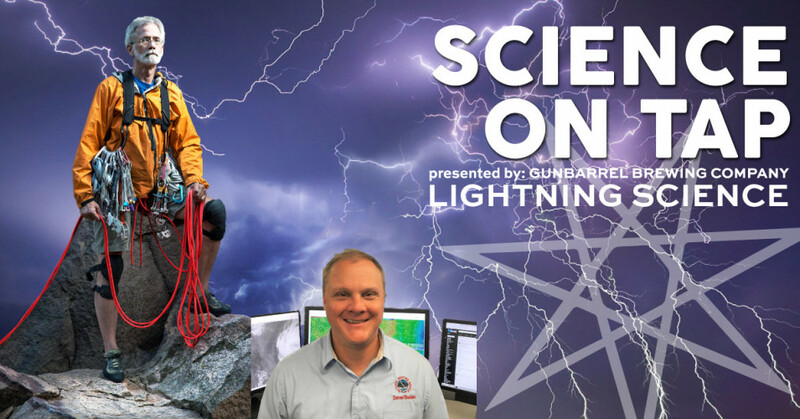 Presented by Gunbarrel Brewing Company, local scientists across a variety of disciplines present their work in a fun, informal, and interactive setting while enjoying some of Boulder’s finest craft beers. You can expect plenty of beer to be flowing, a 30-40 minute presentation with intermission followed by discussion and Q&A. TICKETS REQUIRED for entry to event. Please arrive early to select a beer, enjoy the food truck and select your seats. Please know that if you are late, you may forfeit your reserved seat. No tickets required to enter taproom. Guests without tickets are welcome to line up at the entry to the talk to fill up unused seats. Un-ticketed guests may select from remaining seats at 7pm, once admitted by venue staff but not prior out of respect for tickets holders.